The walk starts at Fortescue Bay. 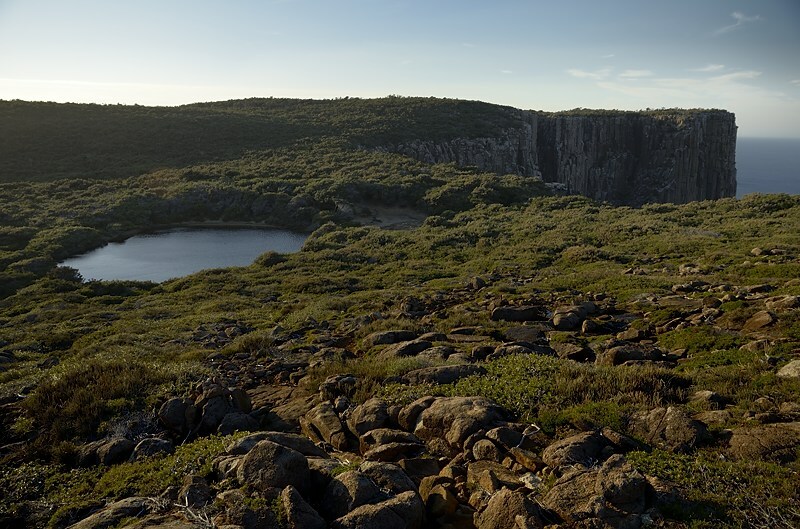 As you drive towards Port Arthur south of Taranna, the road to Fortescue Bay is signposted to the left. Initially this is Crompton Road, and it joins Fortescue Bay Rd after a couple of kilometres. The road is unsealed for the 12km trip through the forest, quite a bit of which has been logged. The track leaves the road a couple of hundred metres before the ranger station, but it is probably best to park in the signposted parking area near the beach. If you park in the very small space across the road from the track you will need to get right off the roadway, and I think you might as well put up a sign saying "Thieves: This car unattended for a day or two." Day One - Walk to campsite, somewhere between Bare Knoll and Perdition Ponds in the morning. Drop packs and proceed to the cape with day packs, returning to your campsite in the evening. The walk out to the cape takes longer than the distance on maps might indicate. Day Two - Return to the road, which will probably take slightly less time than the walk in. Obviously a three-day, two-night trip enables a more leisurely day in between for the visit to the cape, and there is enough to see to fill a day. Choice of campsite isn't necessarily easy. The best water is at Lunchtime Creek, but this is some distance from the cape and cliff views. Water is also often available at the southern end of Corruption Gully, closer to the cape. Perdition Ponds is the most convenient campsite for visiting the cape, and is where I have chosen to camp. The water from the ponds has a slight brackish tang to it, and some people believe it needs to be boiled. I'd probably recommend boiling and taking some Staminade to flavour it as drinking water, but it's fine for cooking and tea/coffee. You could of course carry water in from Lunchtime Creek. Leaving along the track from Fortescue Bay, you head gently around the hillside then down to a substantial bridge over Agnes Creek. Once beyond the creek, the track climbs steadily and back around to the south. For some distance the track climbs in open and attractive forest, until you emerge in open country below Calculation Hill. From here there is a climb onto Calculation Hill, and then onto Tornado Ridge. Winding around Tornado Ridge, you will find the junction of the Mount Fortescue Track at about the high point. A descent to Lunchtime Creek follows and on the way the track passes the Bare Knoll campsites. There are many tentsites amongst the trees, and this site seems to be favoured by school groups. They collect water on their travels from Mount Fortescue or from Lunchtime Creek, and if you are going to try camping here you will have to work out where/when you will get your water. The final descent to Lunchtime Creek is steep. The water is usually flowing well here, but might be unreliable in very dry weather. There is a boot-scrubbing station here, and a few small campsites. You might plan to camp here and find no room, so be prepared for that. From Lunchtime Creek the track climbs again onto Purgatory Hill, and around it into Corruption Gully. There are some campsites and sometimes flowing water here. A little more climbing brings you onto Hurricane Heath, where the track is quite boggy underfoot, including one quagmire spot. Across Hurricane Heath the terrain opens up, until it's just heath amongst boulders, and the track descends to Perdition Ponds. Here I suggest making camp. The awesome views commence about ten minutes beyond this point, enabling sunrise and sunset visits to the clifftops on all days of your visit, and for me this easy capacity to get to the clifftop makes Perdition Ponds the preferred campsite. Eating breakfast or dinner perched 270m above Storm Bay as the sun rises or sets is a great way to start or finish a day. Day One would finish therefore with a visit to the cliffs, continuing along the track up a small hill onto the mainly flat clifftops in this vicinity, until you find a view you are happy with that allows comfortable seating for your party. 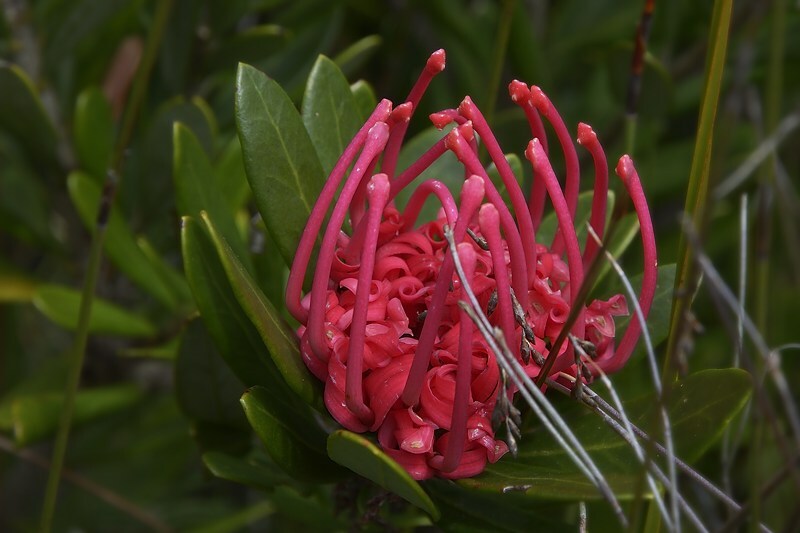 There is one particular spot maybe 15 minutes away, just before the track starts to descend again, which has clear views of The Blade, Tasman Island, the cliffs back towards Port Arthur and also Mount Brown and Cape Raoul to cap it off. Obviously care is required along these cliffs. You can also push through the scrub a very short distance right at Perdition Ponds to emerge on the edge of the cliffs there. This is quite spectacular too, although the view is of the sea rather than any landmarks. 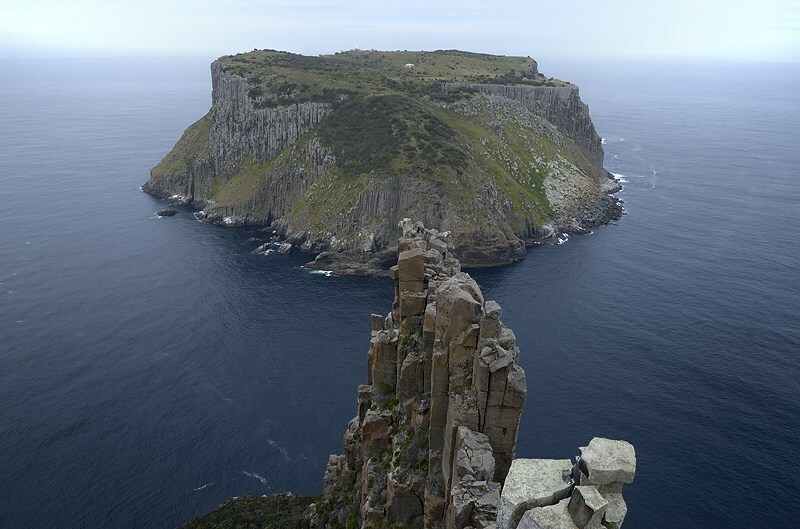 Tasman Island from the best high viewpoint. When ready (perhaps after a sunrise visit to the clifftops) head along the track. There are stunning views at many points along the track, and if you have a whole day to enjoy them, make sure you take the time to stop and soak them in. The track rises first, then descends through a wet area known as The Oasis. I gather there is sometimes enough potable water here to enable camping. The track descends quite a way, and the track becomes rougher and slower. There are low trees to negotiate as well. After some more undulations, a track junction is reached. Turn right to climb The Blade. The view from here is superb, and not to be missed. Those with problems with heights may need to avoid looking down. 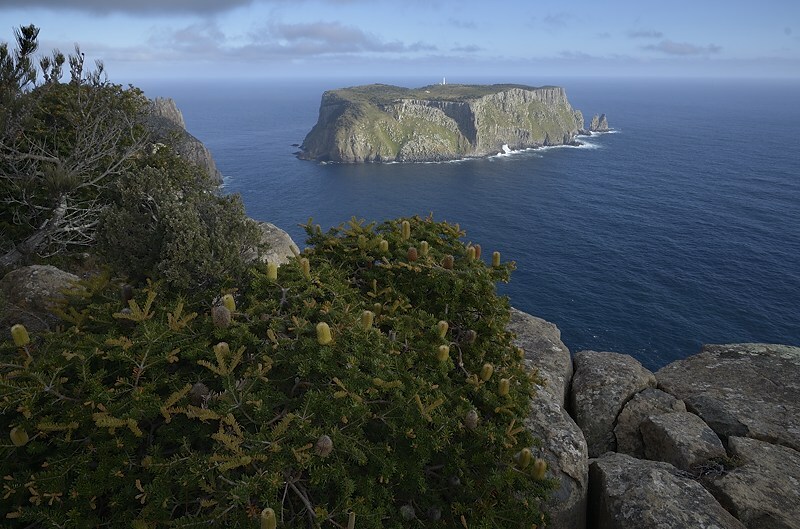 The whole cape area and Tasman Island is laid out below you from here, and it is probably the best view in the walk. You can also see Cape Hauy and Cape Raoul clearly, as well as other features of this coastline. 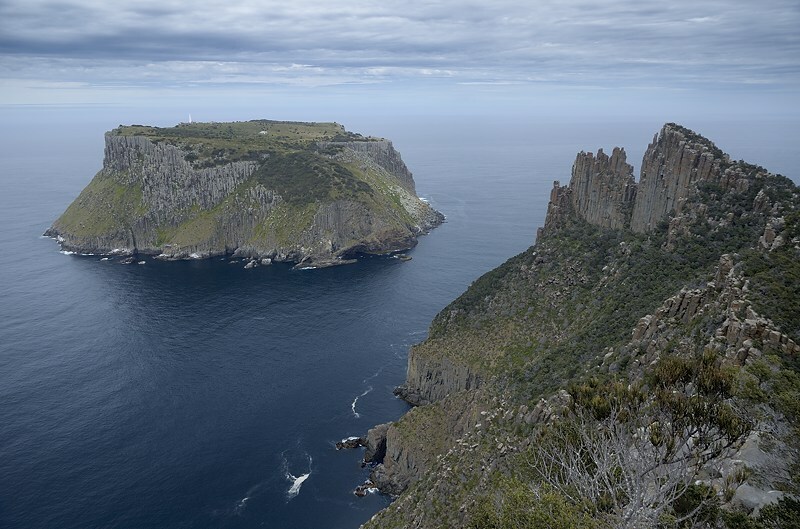 the summit of The Blade is quite airy, and you can step down across a small gap onto a final platform with a large boulder balanced on its edge for the best view of Tasman Island and some vicarious viewing straight down the precipitous cliffs. This edge is not recommended for those who don't like heights, or children of dubious reliability. from the cape high point. Having spent as long as you like on The Blade, you should now climb onto the peaks of the cape which are obvious beyond The Blade. Returning to the track, take the left fork marked to The Chasm. The track descends and then climbs very steeply, with some scrambling and a number of spots where care is required, onto the first hilltop. Spend some time taking in the views here, but then descend beyond it to The Chasm. This is a huge cleft into which the tourist boats sail over 200m below. This requires care, as there are a number of spots where unwary walkers could take a long tumble. In The Chasm, you can get some views below by scrambling on rocks. However, the track does proceed beyond here, and climbs again onto the final hilltop. This bit can be hard to follow up some rocky slopes. 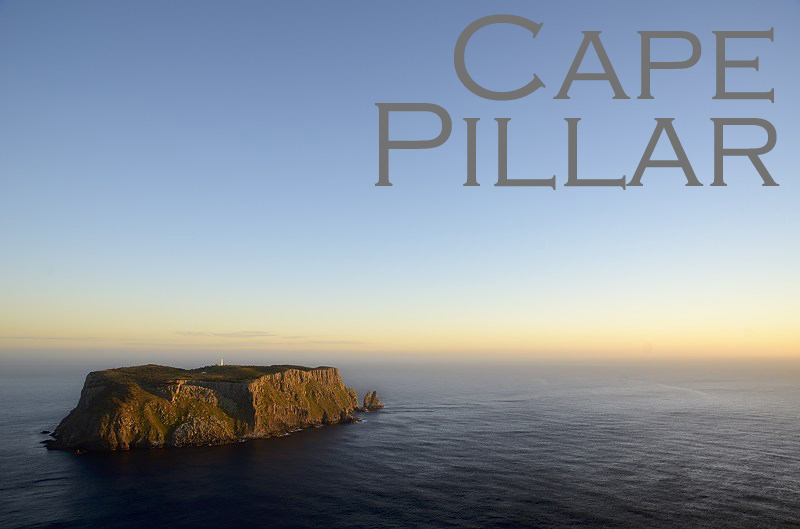 This final hill has views of Tasman Island, vertical views for the brave straight down into the sea at the bottom of The Chasm, and out towards Cathedral Rock on the very eastern tip of the peninsula. Cathedral Rock has been climbed. The final hill here is as far as most sensible people go, although apparently the crazy can descend towards Cathedral Rock. The map indicates it is roughly an average 45° descent so I'm not going to try it. You reverse your outward journey to return to camp. The final day then consists of a return to the car at Fortescue Bay. Some parties vary this by climbing over Mount Fortescue. I haven't been there, and I'm told the views are sparse. I'll update this sometime when I get around to visiting Mount Fortescue.